More than a decade after it began, the war in Iraq is still tying American politicians in knots, posing awkward questions for 2016 presidential candidates of both parties. Former Florida Gov. Jeb Bush, after recasting his answers to questions about the war during the past few days, tried to put the issue to rest Thursday by saying he wouldn’t, in hindsight, have supported the invasion his brother launched in 2003 based on flawed intelligence. With that, he joined an array of potential GOP rivals who had scrambled this week to distance themselves from a war their party supported at the time. The issue also is complicated for Hillary Clinton, the leading Democratic presidential candidate. She faces lingering liberal skepticism for voting for the war while in the Senate, as well as GOP criticism of Obama administration policies that left Iraq unstable after U.S. troops withdrew in 2011. 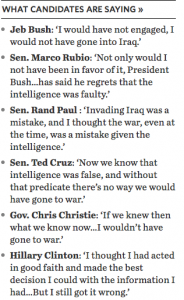 Few people in either party seem eager to make the Iraq war central to the 2016 campaign. But the long, inconclusive conflict has shadowed U.S. politics for more than a decade, much as the Vietnam War did in the 1968, 1972 and 1976 elections in its aftermath.